BROWNSBURG — The Brownsburg band and color guard received a huge surprise and honor Tuesday. They're heading to the 2020 Macy's Thanksgiving Day Parade. 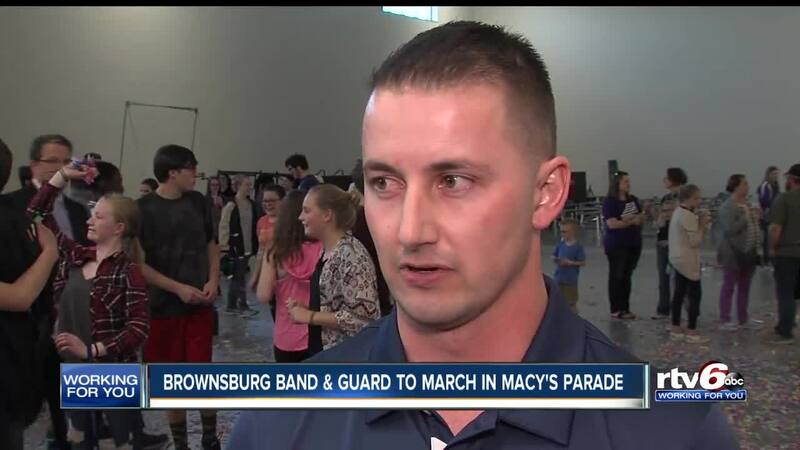 Brownsburg is one of nine bands picked to march in the parade out of more than 100 applicants. "This is so special because every year we're watching the Macy's parade and every year we think about, 'Wow, what if we got to do that?" and now it's kind of like a dream come true. I would never expect that." Macy's staff worked with band director Chris Kaflik to surprise students. "This was a goal of ours for a few years," Kaflik said. "So our students being able to perform here is probably one of the most sought-after performance opportunities for a maching band out there. So it means a lot to us that our students are finally going to get a chance to perform on a platform this big." "The Sound of Brownsburg" is marching in the 2020 parade, so they have more than a year-and-a-half to prepare.